Green teas with added fruits herbs and flavours. All the green tea benefits but with more fun! The tea tends light liquoring, fresh and smooth with reasonable depth and body. The cranberry flavouring and subtle rose hints give the tea a wonderful exotic character. The tea tends light liquoring, fresh and smooth with reasonable depth and body. The Mint flavoring makes this a tea good to be drunk hot or cold. The tea tends light liquoring, fresh and smooth with reasonable depth and body. 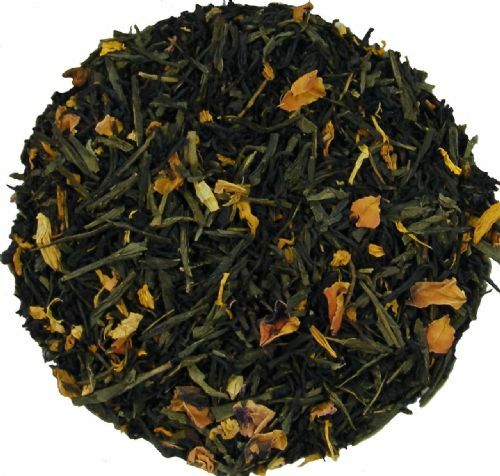 The Lemon flavoring and subtle Ginger hints give the tea a wonderful exotic character. The tea tends light liquoring, fresh and smooth with reasonable depth and body. The flavoring and subtle flavour notes give the tea a wonderful exotic character. The tea tends light liquoring, fresh and smooth with reasonable depth and body. A green tea with surprising body and a captivating floral taste that is not found in any other natural tea. The tea tends light liquoring, fresh and smooth with reasonable depth and body. The Lemon flavoring gives the tea a wonderful refreshing character. The tea tends light liquoring, fresh and smooth with reasonable depth and body. The Mango flavoring and subtle mellow Sencha base give the tea a wonderful exotic character. The Cherry pieces and flavoring along with the subtle mellow Sencha base give the tea a wonderful exotic character. The peach and mango blend gives a truly heavenly glow on your taste buds. A wonderfully exotic and very delicate fruit character. The fine, elegant taste of plums and mirabelles are a delight for the taste buds.